One of the main reasons ASCII art was born was because early printers often lacked graphics ability and thus characters were used in place of graphic marks. Also, to mark divisions between different print jobs from different users, bulk printers often used ASCII art to print large banners, making the division easier to spot so that the results could be more easily separated by a computer operator or clerk. 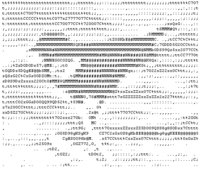 ASCII art was also used in early e-mail when images could not be embedded. 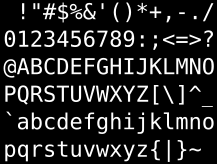 ASCII art can also be used for typesetting initials. Since 1867 typewriters have been used for creating visual art. The oldest known preserved example of typewriter art is a picture of a butterfly made in 1898 by Flora Stacey. "0verkill" is a 2D platform multiplayer shooter game designed entirely in color ASCII art. 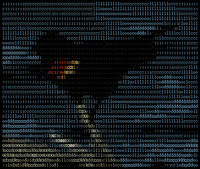 MPlayer and VLC media player can display videos as ASCII art. ASCII art is used in the making of DOS-based ZZT games. Different techniques could be used in ASCII art to obtain different artistic effects. Electronic circuits and diagrams were implemented by typewriter or teletype and provided the pretense for ASCII. H   H E     L     L     O   O      W W W O   O R   R L     D   D !! HHHHH EEEEE L     L     O   O      W W W O   O RRRR  L     D   D !! The simplest forms of ASCII art are combinations of two or three characters for expressing emotion in text. They are commonly referred to as 'emoticon', 'smilie', or 'smiley'. There is another type of one-line ASCII art that does not require the mental rotation of pictures, which is widely known in Japan as kaomoji (literally "face characters".) Traditionally, they are referred to as "ASCII face". More complex examples use several lines of text to draw large symbols or more complex figures. Hundreds of different text smileys were developed over time, but only a few were generally accepted, used and understood. The Adventures of Nerd Boy, or just Nerd Boy is an ASCII comic by Joaquim Gândara between 6 August 2001 and 17 July 2007, consisting of 600 strips. They were posted to ASCII art newsgroup alt.ascii-art and on the website. Some strips have been translated to Polish and French. The Atari 400/800 which were released in 1979 did not follow the ASCII standard and had its own character set, called ATASCII. 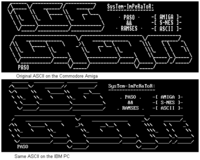 The emergence of ATASCII art coincided with the growing popularity of BBS Systems caused by availability of the acoustic couplers that were compatible with the 8-bit home computers. ATASCII text animations are also referred to as "break animations" by the Atari sceners. This is one of the earliest forms of ASCII art, dating back to the early days of the 1960s minicomputers and teletypes. 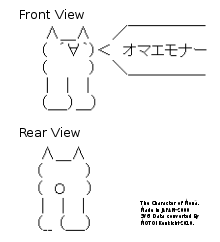 During the 1970s it was popular in malls to get a t-shirt with a photograph printed in ASCII art on it from an automated kiosk manned by a computer. With the advent of the web and HTML and CSS, many ASCII conversion programs will now quantize to a full RGB colorspace, enabling colorized ASCII images. Still images or movies can also be converted to ASCII on various UNIX and UNIX-Like systems using the aalib (black and white) or libcaca (colour) graphics device driver, or the VLC media player under Windows, Linux or OS X; all of which render the screen using ASCII symbols instead of pixels. See also O'Reilly article "Watch Videos in ASCII art". There are now many tools and programs that can transform raster images into text symbols; some of these tools can operate on streaming video. For example, the music video for pop singer Beck Hansen's song "Black Tambourine" is made up entirely of ASCII characters that approximate the original footage. Vlc, a media player software, can render any video in colored ASCII through the libcaca module. A large character selection and the availability of fixed-width characters allow Japanese users to use Shift JIS as a text-based art on Japanese websites. Japanese mainly refer to ASCII-art (AA) as Shift-JIS Art in Japan. In this background,Independently generation author of the Japanese original  in Japan, the ASCII-NET(People with disabilities of related Bulletin board system.) SIG Operator (シグオペ, The Forum's Leaders) Mr.Yasushi Wakabayashi (若林泰志, わかばやしやすし)," the author eastern emoticons. The PC communications in June 20, 1986 00:28:26(JST) From the "face mark" was published Art by the derived has an eastern emoticon, has been recognized as a Character of actors, that a reason. In other words, the ASCII, does not refer to the American Standard Code, refers to ASCII-NET's art as ASCII Corporation. ↑ Stark, Joan G. (2001). "The History of ASCII (Text) Art". Archived from the original on 24 October 2009. Retrieved 5 March 2008. ↑ Robert, Paul (11 May 2005). "Typewriter Art". The Virtual Typewriter Museum. Retrieved 5 March 2008. ↑ Green, Wayne (June 1972). RTTY Handbook. Blue Ridge Summit, Pennsylvania: G/L Tab Books. ISBN 0-8306-2597-6. ↑ Downs, Makarios. "16 bit addition the easy/hard way". ↑ Collin Cunningham. "Schematics just look cooler in ASCII". ↑ Cumbrowski, Carsten (14 February 2007). "Keyboard Text Art From Over Twenty Years Before ASCII". roysac.com. Retrieved 5 March 2008. ↑ Gândara, Joaquim (2006). "The Adventures of Nerd Boy". Nerd-Boy.net. Retrieved 5 March 2008. ↑ "ASCII Art Generator: An Overview". 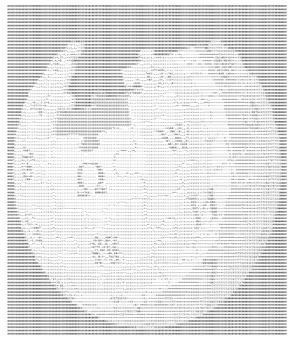 asciiartgenerator.net. 12 January 2012. Retrieved 19 March 2012. ↑ Jansen, Simon (18 April 2006). "Star "ASCIImation" Wars". Asciimation.co.nz. Archived from the original on 9 December 2008. Retrieved 18 November 2008. ↑ Yuki, Yoshimori (2008), 顔文字の起源はいつ？――The First Smiley :-) (2/2), Tokyo,JAPAN: IT Media Corporation. 吉森ゆき, p. 2, retrieved January 16, 2013 . ↑ Zakas, Laimonas. "Facebook Page Performance Art Glitchr". TechCrunch. AOL. Retrieved 23 May 2015.